We have got several copies of Divided City & Walk the Walk which are available for any club member to take home and read. Both novels were developed to educate young people about the consequences of sectarianism and are used by secondary schools to develop pupils understanding of the issue. A young man lies bleeding in the street. It could be any street, in any city. But it’s not. It’s Glasgow. And it’s May – the marching season. The Orange Walks have begun. Graham doesn’t want to be involved. He just wants to play football with his new mate, Joe. But when he witnesses a shocking moment of violence, suddenly he and Joe are involved. With Catholics, and with Protestants. With a young Muslim asylum-seeker, and his girlfriend. With all the old rivalries – and fears …A gripping tale about two boys who must find their own answers – and their own way forward – in a world divided by differences. 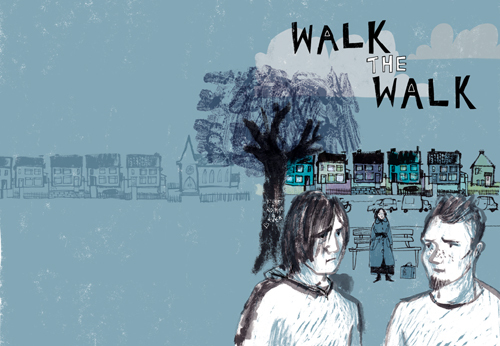 During December 2014, literacy tutors and support workers across Scotland will be receivingcopies of the graphic novel Walk The Walk for use with learners who attend literacy support groups.This book was developed by Scottish Book Trust in collaboration with learners and tutors and written by Gowan Calder and illustrated by Jill Calder, with support from the Scottish Government, as one of the 44 projects created to help to tackle sectarianism. Walk The Walk will not only help develop literacy skills but will also provide an educational opportunity to explore possible solutions, issues and circumstances that surround sectarian behaviour. Rab McGowan and Robbie Black are firm friends. Old Firm friends, you might say. The two boys, who live at opposite ends of the same street, have been inseparable since primary school. On this street, The Walk, there is a split between the top end and the bottom end and it sometimes feels more like a war zone than a neighbourhood.As Rab’s cousin Kylie gets ready to marry Robbie’s brother Romeo, tempers are flaring and both families think the wedding is a betrayal of their roots. Can Rab and Robbie get the residents of The Walk to put their differences aside for just one day? This entry was posted in Sectarianism on 27th February 2015 by Chris Main.